Long-lived, durable, reliable and beautiful too – if anything in the garden deserves these words, it is the Peony. Nothing can suggest a classic garden more than the Peony, and yet these plants also have a timeless quality, looking gorgeous in any garden setting, from the most formal to the nearly-wild. If the classic double flowers look too highly-bred for your taste, there are single flowers to choose from too, but whatever your garden, a Peony bush – or several – will always fit perfectly, and once established perform reliably year after year, after year. Somewhere between a shrub and a flower, these plants look almost as good when just green leaves, and they have vibrant fall colors too, as a bonus. 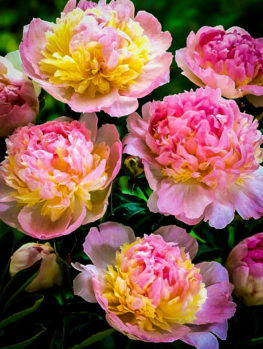 It doesn’t matter if you build a garden based on shrubs and trees, or one with many flowering perennial plants, Peonies will fit right in, and bring an enormous punch of color just when spring is turning into summer, and the garden is at its peak. Once planted they ask for no special care, and every year they become fuller and richer, with more and more blooms. They live for decades, and gardeners always say that when you start a flower garden, the first thing to plant are the Peonies. Once in place, they are there for the long-haul, and the other flowering plants, which usually live for a shorter time, can be fitted in around them. Planted singly, or in groups, among shrubs, they bring dramatic blooms just when we want them, and then remain as attractive leaves, while other plants take over the color parade. With such large blooms, which can be 8 inches across, or even more, it is hard to believe that these plants are hardy even in zone 2. Peony blooms are available in many different forms, from single flowers with a few petals and a large yellow center, to double flowers with literally hundreds of petals making up the dome-shaped center. All shapes in between also can be found, and the colors range from pure white to the darkest reds, with every possible shade of pink and red in between. There are also some that have coral-colored flowers, or purple flowers, and even some rare yellows. The colors can be solid, or speckled, uniform or shaded. No matter what you like, there will be a Peony bloom for you. The plants themselves are perennial flowers, not true shrubs, as most kinds die back to the ground each fall, and re-emerge in spring from fat buds on the woody roots, safely protected underground from the cold. The stems emerge in a clump from the roots, and older plants can have 50 or even more stems – with a blossom on the end of every one. In spring, fat new shoots thrust from the ground like tiny arms with clenched fists on the end – often in rich shades of red. As they grow up – and most plants grow to between 2 and 4 feet tall, and the same across, when mature. The handsome leaves spread out, with flowers buds showing on the ends of each stem. The attractive leaves are spaced along the stems, and each leaf is divided into sections, so even when not in bloom the plant is an attractive clump of glossy, green foliage, which lasts into fall. In the fall the leaves usually turn glowing shades of yellow, orange and red, before dying down to the ground. The traditional way to use Peonies in the garden is to grow them among other flowering plants, such as Iris, Phlox, Day-Lilies and Asters in a bed designed to be in flower for months of the year. These borders look spectacular, but there are other options, and you can do simpler things with your Peony bushes. Since they will grow in light shade, a row of Peonies is a terrific way to bring interest to the north side of your home, an outdoor building or a fence. They will also grow in full-sun and partial-shade, so these versatile plants can be used almost anywhere. Mix them with flowering shrubs, because like shrubs, once the flowering is over the stems and leaves remain as an attractive bushy plant. Grow them in the sunnier parts of a woodland garden, especially if you choose simple colors, or single-flowering forms, which look closer to the wild plants you might already be growing in that part of your garden. Because they are relatively small, and will never grow too tall, Peonies are also great plants for popping into corners, or those small spaces that can happen between other bushes – great for giving your garden that density and continuity that makes for a great visual picture in the garden. They can even be planted among dwarf evergreens and shrubs in a xeric bed, covered with pebbles, because established plans are very drought-resistant once the flowering period has passed. Since Peonies can be cut and brought indoors for vases – where they will last almost as long as outdoors– you can also grow your Peonies in a cut-flower garden too. Their rich and exotic beauty will be fully appreciated close up in vases. You can even plant them along one side of your vegetable garden, where some can be cut, and the rest left to bring color and beauty to the simplest part of your garden. 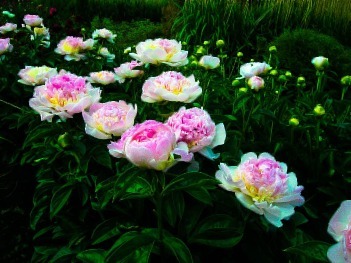 No matter where you choose to plant them – and you have many choices, as you can see – Peonies will become outstanding, easy to grow plants in your garden, bringing something special and unique. No garden should be without these remarkable plants. There are around 30 species of Peonies that grow new from the ground each year (called herbaceous), and another 8 that are true woody shrubs. Apart from two atypical and rare species from North America, they are found naturally around the Mediterranean in Europe and North Africa, and then all across Central Asia, Russia, China and into Japan. The woody types are only found in China. The vast majority of the Peonies grown in gardens originate from just one species, so we will take a look at that one first. This species, called the Chinese Peony, grows wild in central China and Tibet, but it has been cultivated by the Chinese for at least 2,500 years, first for medicine and food, and then as a garden plant. It was introduced into Japan 1,000 years ago, and there, starting especially in the 18th century, intensive breeding of new varieties took place. In Europe another species, Paeonia officinalis, which grows in southern France, Switzerland and Italy, had been cultivated for centuries too, but it was only when the Chinese Peony arrived in the 19th century that Europeans and Americans took much interest in Peonies. In the late 19th and early 20th centuries, hundreds of new varieties were developed, mostly in France and the UK, and most of the plants we grow today come from that period. Single – 6 to 12 petals in one or two rows, around a fuzzy yellow clump of stamens with pollen. Semi-double – two, three or more rows of petals, with some of the stamens in the center like narrow petals (stamenoids). Japanese – semi-double, but with all the stamens converted into narrow petals with yellow tips. Anemone – a Japanese form, but with broader petaloid stamens, of a solid color. Double – a full ball of petals, with no stamens or stamenoids visible. Bomb – a double flower with a ring of petals around it, called guard petals, like an anemone-flowered type. Sometimes called ‘double bomb’. The Peony Shirley Temple is one of the great classic Peonies, named after a famous Hollywood child star. Begins pale pink, and then turns creamy white as the flower opens fully. Petals in whorls on strong stems. A perfect garden plant, and excellent for cutting too. A cross between “Festiva Maxima” and “Mme. Edouard Doriat”, of unknown origin before 1948. A real favorite, widely grown as a cut flower for florists. The Peony Raspberry Sundae is a gorgeous bomb form with pale pink guard petals and a central bomb of yellow and deeper pink petaloids. Enormous blossom, strong stems and a rich fragrance. Like raspberry sauce dripping over vanilla ice-cream – delicious. Named after the actress of the Victorian era. Easily grown and producing many flowers on tall, strong stems. One of the last to bloom, extending the Peony season into summer. Pink petals with silver-white tips in a perfect double form. This is a 150-year-old heirloom variety, and still popular. Pure white with splashes of crimson at random through the petals, different on every flower. A unique apricot coral-pink semi-double, fading to peach. Up to 4 feet tall, very vigorous, with giant flowers. Extremely striking in any garden. Living up to its name, this Japanese-form Peony can be 12 inches across – but never needs staking. The guard petals are rich pink, and the stamenoids are lemon yellow. Considered by many to be the best red Peony there is. A very dark, glossy red, among the first to bloom, with a bomb form in one solid color throughout. 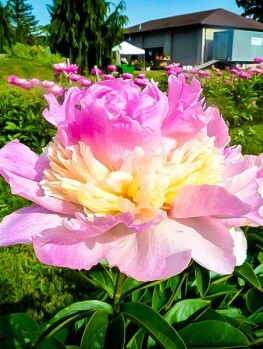 There are hundreds of different varieties of Peonies, and there is hardly a one that is not beautiful and desirable. So if we do have the varieties above listed, don’t worry, those that we do have will be just as gorgeous and worthy of growing in your garden. Perhaps the most remarkable thing about Peonies is that, considering their stunning beauty, these plants are hardy even in zone 2, where winter temperatures plunge to minus 50. Yet they will grow well even in zone 8, and also in less-humid parts of zone 9. They will grow in any well-drained soil, and they live for decades, growing steadily larger, so that mature plants can have well over 50 blooms on them. Peony bushes will grow in full sun or partial shade. They will also grow in the shade from buildings, but not in continuous shade directly under trees. In warmer areas shade in the afternoon is better than shade in the morning with exposure to hot afternoon sun, especially in summer. They will grow in all kinds of well-drained soil, but they grow best, and produce the most blooms, in soil that has been enriched with plenty of organic material, such as compost or well-rotted animal manures. They are usually free of significant pests or diseases, and generally not eaten by rabbits. They should have plenty of water when young, and also during the spring, when they are developing the flowers. If they are too dry the buds can fail to develop, so water regularly in spring, if the ground becomes dry. Mulch plants every year or second year between late fall and late winter, with a 3-inch layer of organic material. No other fertilizer is needed. Try to plant your Peonies in their final locations from the beginning, as plants have large root systems, and they are difficult to move when mature, and it can take several years for plants to recover. Some varieties need support when in bloom, to keep the blooms upright. This is best done with canes and string, and large tomato cages are also very useful for supporting plants while flowering. Once the flower petals have fallen, cut off the flower at the first larger leaf on the stem. After that, support is usually not needed, and it can be taken away. In fall, once the leaves have changed color, they can be cut down to one or two inches above the ground. Leaving a short stem helps you see the plants in spring, so that you do not accidentally step on the new shoots, or injure them when digging in the beds. Peony flowers last well in vases, but they should be cut at the correct stage of bud development. Feel the bud. If it is hard, it is too soon to cut it. Wait until it feels soft, and when the first petals are beginning to separate from the bud is a good stage for cutting. Never cut the stem all the way to the ground – leave at least 3 leaves on the stem, for the strength of the plant. Cut stems early in the morning, and place them immediately into cold water. When you are arranging them, remove all the leaves that will be below the water, as they will rot and reduce the life of the flowers. Cut the stem again, underwater, just before placing them into a clean vase already filled with water. Use clean tools and vases, and use a commercial flower food, to feed the flowers and reduce bacteria in the water. You can hold the development of buds back by a few days by standing them in a bucket of water in a cool place, near, but not at, freezing point. Inside a refrigerator is a good place, but do not keep them with fruit or tomatoes, as these accelerate the opening of the flowers. 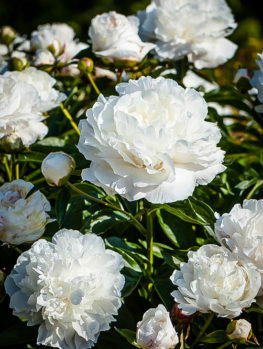 Almost all the Peonies grown in gardens are forms of the Chinese Peony, but there are others as well, and some make excellent garden plants – even if they are rarely grown. The most widely-grown other group of Peonies are the tree Peonies, and as well, some forms of a few wild species will be seen in gardens from time to time. These spectacular plants have been cultivated and bred in China for centuries, originally as medicine, and later for the beauty of their flowers. This group of plants, known as Paeonia x suffruticosa, is a hybrid collection created over hundreds of years from several wild species. Unlike Chinese Peonies, tree Peonies do not die down to the ground in fall, but instead they have persistent woody stems, with buds that sprout in spring, much like ordinary shrubs. They are hardy from zone 4 to zone 8, so although not as hardy as Chinese Peonies, they can still be grown over a wide part of the country. They grow to around 5 feet tall, although some may grow taller. Even when not in flower these plants are beautiful, with large, deeply-divided leaves with an elegant and graceful effect. But it is the flowers that are the high-point, because they are extremely large, and the petals are crinkled, like crepe-paper. They can be found in brilliant shades of pinks, purples, lilacs, reds, white and even yellows – a full rainbow of color. Many, many different varieties have been raised in China and around the world, and gardeners can choose from an enormous range of plants. The only draw-back with tree Peonies is they slow growth-rate, adding just a few inches a year, so it takes several years before you have a large plant. Most wild Peonies are of interest only to collectors, but one, the fern-leaf Peony, Paeonia tenuifolia, is very beautiful, comes in several garden forms, and is a worth-while plant in a regular garden. This species grows wild in Russia and the Ukraine, and it has been grown in gardens for centuries. The leaves are divided many times over, so that there the plant has a light, airy appearance, and lives up to its name of ‘fern-leaf’. The flowers are brilliant red, with glossy petals, and although the wild plant is a single flower, there are also beautiful double-forms available, and this is the form usually seen in gardens. 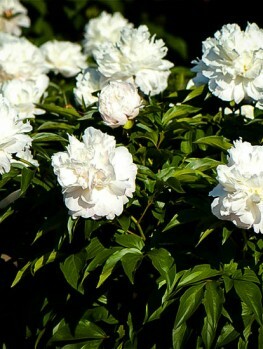 These make a dramatic addition to a collection of Chinese Peonies, and are always eye-catching.